where P is the pressure and V is the volume. Normally, as the hydrostatic pressure is increased, a material / structure decreases in size from all directions, whilst as the hydrostatic pressure is reduced, the material / structure experiences an increases in size from all directions (see Fig 1a). Such ‘normal’ systems are said to have a positive compressibility. Systems with negative compressibility i.e. systems which increase in size as the hydrostatic pressure is increased and decrease in size as the hydrostatic pressure is increased, are ‘assumed’ to be forbidden by classical thermodynamics [Münster 1969, Kubo 1968, Wallace 1972]. However a number of reports in the literature have shown that such negative compressibility is possible. In fact, cesium dihydrogen phosphate [Prawer 1985], orthorhombic high-pressure paratellurite(TeO2) phase [Skelton 1976], lanthanum niobate [Mariathasan 1985], Ag3[Co(CN)6] [Goodwin, 2008] and isomorphous trigonal Selenium, Tellurium phases [Munn 1972, Nelson 1993] and methanol monohydrate [Fortes 2011] were all reported to exhibit linear negative compressibility (i.e. one side of the system gets larger when the hydrostatic pressure is increased, whilst the other two sides behave in an expected manner). In 1998, Baughman reported that rare crystal phases may exhibit linear or area negative compressibility and also argued that a network having stretch densified rods is envisaged to exhibit negative volumetric compressibility [Baughman, 1998a]. Later, Lakes also argued that open cell foams may also exhibit incremental negative compressibility [Moore 2006, Moore 2007]. In 2008, Lakes and Wojciechowski challenged the assumption that the bulk modulus needs to be positive and argued that there exists no convincing interpretation in thermodynamics which states that a constrained solid object may not exhibit a negative bulk modulus [Lakes 2008]. More recently, Stepanov argued that the phenomenon of negative compressibility could be used to modify the Clapeyron equation, which is an equation used to calculate phase diagrams, resulting in a much superior version [Stepanov 2010]. As in the case of auxetic materials, materials having negative compressibility are of interest because they offer a number of advantages in the design of high-tech applications. For example, such systems can be used as extremely sensitive pressure detectors (Baughman, 1998a) and in telecommunication line systems, where if they are designed to exhibit a compressibility of zero, they would not be affected by the high pressures when lowed deep in the sea. Also, it was postulated that such systems may have very high refractive index thus would give high advantages when used in optical materials (Baughman, 1998a). Figure 1 (a): A conventional system which gets larger when the external hydrostatic pressure is decreased and (b) a negative compressibility system which gets smaller when the external hydrostatic pressure is decreased . 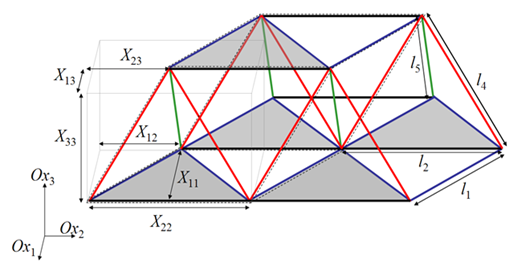 Structures with a Negative Compressibility proposed by the Malta Group. It has long been known that when two materials having different coefficients of thermal expansion (CTE) are glued together, they will curve when subjected to a change in temperature, as in the case of a bi-metallic strip in a thermostat mechanism. 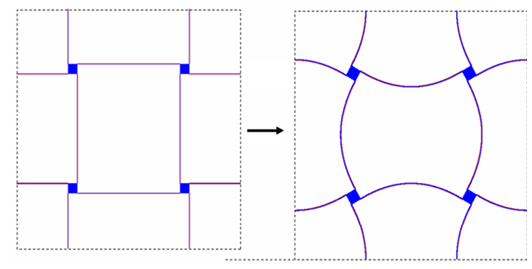 Nevertheless, it is important to note that the same strips will also curve when subjected to a change in pressure, a behaviour which becomes appreciable when the constituent materials have sufficiently different moduli and/or Poisson’s ratios, and/or when the pressure change is sufficiently large. This bending is caused by the different strains each material would experience in the free (unbound) state. This mismatch in strains would result in internal stresses which in turn bend the bi-material strip. This is in itself a very important property of bi-material strips which unfortunately is much less publicised than the analogous effect which results when the strips are subjected to temperature changes. Furthermore, such bi-material elements can be used in the construction of smart structures which utilise this effect to exhibit unusual macroscopic properties, including negative compressibility. Figure2: The chrial system subjected to a positive, clearly showing a negative compressibility. A very basic, yet simple unit that has a potential to exhibit negative compressibility is a triangle constructed from pin-jointed rods, where the rod forming the base of the triangle is made up of a material that has different mechanical properties than that used for the other two rods making up the sides of the triangles. More specifically, if the base rod expands to a higher extent than the sides when the structure is subjected to a decrease in pressure, the triangle is flattened (the ‘triangular shortening’ effect), i.e. its height decreases to exhibit linear negative compressibility in that direction. (Note that this ‘triangular shortening’ concept has already been used before for generating negative thermal expansion. 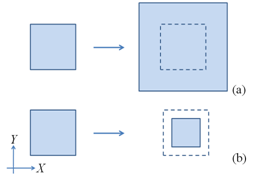 This concept can be used to construct 2D and 3D systems, with adjustable linear, area and/or volume compressibility, which can also be negative. It is well known that negative linear compressibility (i.e. expand in one direction when compressed hydrostatically) is possible in systems with significant anisotropy as these could still behave in such a way that the overall volumetric compressibility is positive, thus ensuring that there is no violation of the energy conservation law. It can be shown that systems with a large enough Poisson’s ratio highly can exhibit this property. This effect has been studied in hexagonal honeycombs and related systems where it was shown through analytical modelling that under the correct conditions non re-entrant hexagonal honeycombs and wine-rack type systems may exhibit the anomalous property of negative compressibility in certain directions, which model correctly predicts the direction of negative compressibility in methanol monohydrate reported recently [Fortes 2011]. All this is very significant due to the fact that this model suggests how materials having nanostructures which in particular planes may be described in terms of honeycombs or wine-rack geometries, may exhibit negative compressibility under certain conditions only if they deform through the correct deformation mechanism. More importantly it specifies the conditions which are necessary for such property to be manifested. In particular, the model suggests that, for example, a wine-rack type system will only exhibit negative compressibility in the direction where the model is already slightly extended (see Fig. 13 3). In this respect, it is important to note that this hypothesis is supported by the recent work by Fortes et al. [Fortes 2011] whose analysis of the presented crystal structure data and mechanical properties clearly suggests that methanol monohydrate exhibits negative compressibility in the direction predicted by the model presented as illustrated in Figure 4. Here, it should be highlighted that not all real materials having honeycomb or wine-rack geometries will exhibit negative linear compressibility since for this property to be manifested it is required that the hinging mechanism is the predominant mechanism and that the geometry is amenable. Figure 4: Honeycomb system and wine rack system which exhibit negative compressibility. 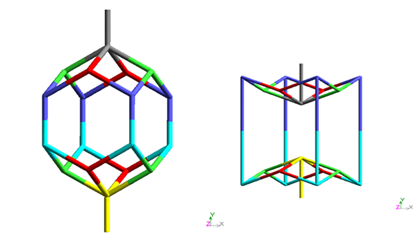 Furthermore, the elongated hexagon dodecahedron, a geometry which is considered to be the 3D equivalent to the much studied 2D honeycomb structure was also found to exhibit negative compressibility at certain angles when it has a large positive Poisson’s ratio. Science/Engineering graduates welcome to apply. Get the latest news about our publications.